Mr. and Mrs. Muskrat catch a giant golden catfish who asks for their mercy in return for a wish. Mrs. Muskrat wishes small and practical, but Mr. Muskrat keeps wishing bigger and bigger. 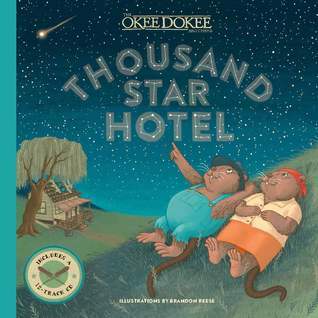 His wish for not a 5-Star, but a Thousand Star hotel is granted, but you might guess from the cover that it's not quite what he expected. Luckily, Mrs. Muskrat knows how to make the best of the situation. "Some people dipped their pizza in hummus, while others dipped their piza in guacamole. Some people made pizza chow mein and some people made pizza sushi. Some even made pizza soup." 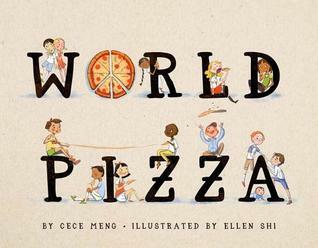 Pizza solves problems, brings people together, and inspires love and kindness. Maybe mama got her wish after all! 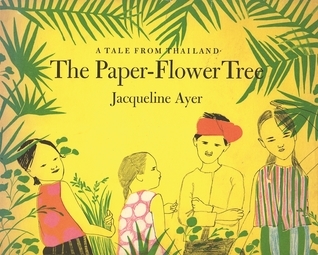 Miss Moon falls in love with the paper-flower tree carried by the man who is traveling through her small village. She wants one of her own. The man gives her a paper flower that has a small bead -- a seed, he says -- to plant, which she does, watering it and keeping watch over it in spite of all who ridicule her. A year later, when the old man returns again with a troupe of performers, she reminds him about the paper-flower tree seed and tells him she's planted it and cared for it. The next morning, there is a paper-flower tree blooming right outside her house. No one else in the village believes that it grew from the bead/seed, but Miss Moon believes. Love the look and your review of each of these, Mary Lee. I'm glad you shared!